Swiggy IPL Match Day Mania: Grab up to 60% Off on food items from top rated and selected restaurants and additional 10% discount for swiggy super users. Swiggy Referral Offer: Just refer a friend from the 'invite' section of the app and you will get Rs 100 off on Rs 199 and above orders and your friend also get the same discount i.e. for both referee & referrer in all cities. Valid across all cities on mobile app only. Get tasty desserts/beverage or side free on every order with its delights program from select restaurants, valid only for super subscribed users. Grab Flat Rs 30 cashback on first 10 orders, using amazon pay wallet online. Not applicable on Domino's Pizza restaurants. Cashback will be credit into your wallet in 3 business days. Order Now! Coupon/Offer Details: Order online at Swiggy web and app using HSBC credit card and grab flat 25% discount up to Rs 150. Minimum cart value - Rs 350. Valid twice per user during the offer period. Get assured scratch card between Rs.20 to Rs.100 using PhonePe wallet. Coupon/Offer Details: Swiggy has just launched its food delivery services in pune region, Explore their offers and use code at checkout to enjoy 50% off (maximum discount of Rs 100) on your first 5 orders from app. Minimum cart amount is not required. Hurry Up! Coupon/Offer Details: Get flat 15% off when you pay for your order using RBL Bank credit card. Minimum transaction amount of Rs 300 is required. Apply the promocode required to avail this offer both in app and website. Valid in all operational cities. Maximum discount is Rs 200. Offer valid on 1 transaction per user per offer day and cannot be clubbed with any other scheme. Applicable on Saturdays and Sundays only. Do it Now!! Minimum cart value of Rs 150 is required. Promo excludes domino's pizza orders. Now order any 2 milkshakes/sundaes at keventers and get 50% OFF. No minimum cart value required. Also get free delivery. Order now! Verified on 20 Apr 2019. Order now on app and website and grab New 'Chick & Share' bucket (large popcorn) + 3 Pepsi cans for Rs 447 from KFC stores. Coupon is not required. Applicable for all users in Mumbai, Delhi, Pune, Hyderabad, Bangalore, Gurgaon, Chennai cities. Also, Save 43% with KFC's cricket special! 4pc Hot & Crispy, 8pc Boneless, and 6pc Hot wings chicken which can be ordered at just Rs 476. Hurry Up!! Coupon/Offer Details: Swiggy Delhi users now get yummy treat and special combos at lowest price, where crazy food lover gets delectable burgers, starters, sandwiches, subs, pastas, combos, veg & non-veg varieties, desserts, beverages etc. from select restaurants. Order 2 crispy veg supreme burgers starting at Rs 79, up to 33% Off from buger king. Grab ti! Coupon/Offer Details: Verified on 20 Apr 2019. KFC Super Sixes Deal: Order now from swiggy kfc page and get 18 pcs chicken strips for just Rs 476 by saving 43% on the online purchase. Grab it from the offers page with no additional discount code required. Avail free of cost delivery on all orders today. Hurry!! Coupon/Offer Details: Grab low price on authentic south Indian food in select cities. No offer code needed. Offer auto applies during check out page. With choices varying from healthy to hearty & lightning-fast delivery from the restaurant to your doorstep. Hurry! Why Use Swiggy Coupons Through GrabOn? Apart from amazing food, it also provides all users with coupons and offers. While placing the food order on the app, users can choose from a list of promo codes to cut down expenses. Grab verified and working coupon codes which work for new as well as registered users. The new users can avail 50% OFF on their first five orders along with cashback on payment through mobile wallets. The existing users can also avail the cash back offers while paying through digital wallets. There are plenty of websites listing coupons, but few carry out the exercise to update it regularly. GrabOn provides users with a convenient one-stop destination for verified and validated ones. The users can also use filters by category and payment methods to sort out the right promotional offers. The food delivery portal provides attractive offers & deals for both it's new and existing users. While the new users can avail 50% on the first five orders, the old users can enjoy cashback offer on paying through digital wallets and more. Users can order single meals using the POP option and save on delivery fee by subscribing to the Super program. Order delicious food at affordable prices today, with Swiggy delivery app. What Is Swiggy And What Does It Offer? It is one of the most popular food ordering and delivery services in India. The business offers a wide range of cuisine and dishes to choose from. The users can place the order through the website or the delivery app. The food delivery platform was founded in the year 2014 by two BITS Pilani graduates. Today it provides services to all major Indian cities. With programs like Swiggy pop, the users can order one-serve meals at fixed prices with no extra delivery charges. The users can place the order using the app or the website. The company also rolled out its membership program for both new users and old users. The program, called 'Swiggy Super', provides all users free delivery, zero surge fee, and surprise treats. How To Place An Order On Swiggy? Users can place a food order using the app or through the website. First of all, the user needs to input the current location. The app will list down all the partner restaurants nearby the location. Then the user can choose the desired restaurant. The user requires to select the dish and the portion of food he/she wants to order. The final step is to confirm the order and pay the amount. Here the user can apply coupon codes to avail discounts on the food order. What Are Payment Options Available at Swiggy? After placing an order, a user can choose from various payment methods. Users can choose to pay using their bank credit and debit cards. The App accepts VISA, Mastercard, American Express and Zeta Cards. Users can also pay through net banking. Payment through mobile and digital wallets is also accepted. While paying through mobile wallets, users can avail Paytm offers and similar exciting offers from PhonePe, Amazon Pay, Mobikwik and Freecharge. It also allows payment through Sodexo Food Card. UPI payment methods like Google Pay, BHIM and Pockets by ICICI Bank are valid as well. Last but not the least, Swiggy offers the Pay on Delivery option on food orders. Swiggy to diversify in to cloud kitchens with “Access”: The company is diversifying beyond food delivery and increasing their supply with their own private labels i.e. The Bowl Company & Homely, which approximately contribute to 15% of their order value. Pilot Projects Including Dash & Cafe/ Food Court: The company is planning to soon launch a grocery and medicine delivery service with a dedicated app called Dash. They are also test running a Business to Business (B2B) meal aggregator to act as a digitized corporate cafeteria, soon to be announced as Swiggy Cafe/Food Court. Swiggy forays into the on-demand product deliveries space: The stores will deliver products from varied categories, be it health and supplement, pet care stores, kiranas, supermarkets and more. This will in turn, enable buying and delivery of items from any electronics, flower, gifts or grocery store. Which Cities Does Swiggy Deliver To? 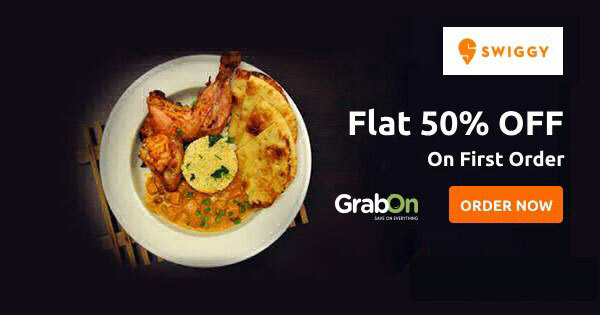 How To Use Swiggy Coupons On GrabOn? Swiggy is an online food ordering and delivery platform based out of Bangalore. The platform partners with eateries and restaurants across various Indian cities. Users can choose from a list of nearby restaurants and place the order. The orders can be placed through the website or using the delivery app. The food order will reach you within the stipulated time. The fast delivery is made possible by the large fleet of delivery personnel. The customers can track their order in real time.